John Podesta called the President a “whack job” and told him to “get a grip man”. TODAY, US PRESIDENT Donald Trump is meeting other world leaders, including Russia’s Vladimir Putin, at the G20 summit in Hamburg. As usual, he’s been tweeting about events there in his idiosyncratic style, with criticisms of fake news and details on the leaders he is meeting. One tweet he sent from the summit, however, led to a very angry tirade from Hillary Clinton’s ex-campaign manager John Podesta who called the President a “whack job” and told him to “get a grip man” on twitter. Here, he is referring to the Democratic National Committee (DNC). Although Podesta was the chair of Hillary Clinton’s ill-fated presidential campaign, he was not in a senior leadership position with the DNC. During the campaign, Podesta’s personal emails here hacked. The information from his emails made it to WikiLeaks, and did further damage to Clinton’s campaign. For some time, US intelligence agencies have believed that Podesta’s emails were hacked by the Russian government. During the election, the emails of the DNC were also hacked. In a series of increasingly testy tweets in response to Trump today, Podesta said that the DNC server had nothing to do with him, and expressed disbelief that world leaders would be talking about this at a G20 summit. He said: “On a x-country road trip with my wife. Pulled in for a pit stop in E. Fairmont W. Va. to see that our whack job POTUS @realDonaldTrump is tweeting about me at the G20. Get a grip man, the Russians committed a crime when they stole my emails to help get you elected President. “Maybe you might try to find a way to mention that to President Putin. BTW, I had nothing to do with the DNC. God only knows what you’ll be raving about on twitter by the time we get to Utah. Dude, get your head in the game. 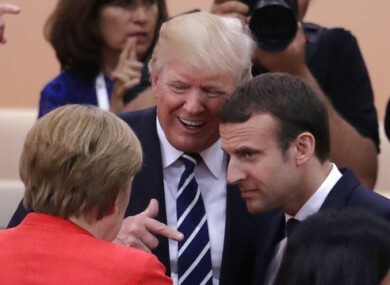 You’re representing the US at the G20. Email “'Get a grip, man': Clinton's ex-campaign chief unleashes angry tirade after Trump tweet”. Feedback on “'Get a grip, man': Clinton's ex-campaign chief unleashes angry tirade after Trump tweet”.